Deciding what to wear for sorority recruitment might be one of the most stressful things in the world. Obviously I am joking, but during the process of picking out your outfits, it can seem like that. I think I sent 50 snapchats to my best friend, Christina, over the course of a month and had her pick what I was going to wear. I also think I tried on every outfit I was going to wear once a week until recruitment. I stressed out way too much about what I wore, so I know the feeling of worrying about what you're going to wear. That's why this week's post are going to be dedicated to figuring out what to wear during each round of rush. I know each school is different, and while the rounds might be switched up, you generally wear the same thing at each school just sometimes in a different order, but the order I am going in is the order Alabama does everything since that's what I know. Today I am talking about the first two rounds, which at Alabama are Ice Water Teas (also known as Open House) and Philanthropy round. At Alabama, PNMs wear sundresses and sandals for IWTs and then shorts and a t-shirt that provided by Panhellenic for Philanthropy round. Overall my biggest tip for figuring out what to wear is to shop your closet first. 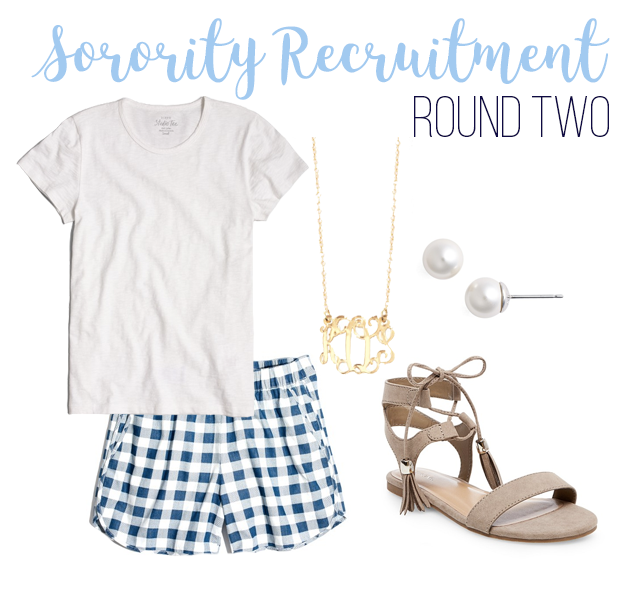 You don't have to go out and spend a ton of money, and you probably already have some pieces that will be perfect for recruitment. For the first round, dresses are definitely the most casual. I actually wore the J.Crew Daybreak dress on both days. Super comfortable and easy to wear, which I think is the most important part about deciding what to wear. Even though the dresses weren't brand new, I felt comfortable in them. With dresses, I think something that is important is the material of your dress because you want it to be breathable but not something that will wrinkle easily. As for shoes I wore Jack Rogers, which I think work really well as long as they're broken in. Definitely wear flat sandals for the sundress round/the first round because you are visiting all of the houses this day, and you're standing and walking pretty much all day. For the second round/the t-shirt round, wear shorts. Don't wear a skirt!! At Alabama during this round a lot of the time you are sitting on the ground, and wearing a skirt makes that so much harder. I sat on the ground for three of the eight houses I went to for philanthropy round. Like I said the shirts you wear will be provided by Panhellenic and are covered in your recruitment registration fee. Usually on your school's Panhellenic website they will provide a picture of what the shirt looks like, so you can match your shorts to the shirt. For shoes I again recommended wear flat sandals just because of the amount of walking you will be doing, but with this round since you're wearing a t-shirt and shorts, definitely have fun with your shoes and show off your style and personality. Be sure to check back on Wednesday and Friday for Rounds 3 and 4!